The best toothpaste should contain fluoride to fight cavities — other ingredients depend on your teeth. After speaking with dentists about common oral hygiene issues, digging into existing research, and brushing our teeth until they gleamed, we found top picks for four toothpaste categories: general purpose, whitening, sensitive, and natural. To prevent cavities, every single dental expert we spoke with told us that fluoride was the one must-have. Fluoride works by strengthening your tooth enamel (the outside layer of the tooth) so it can resist bacteria. It also remineralizes, patching up microscopic holes in your enamel that are caused by bacteria from food. And there’s an overwhelming amount of clinical evidence that it reduces both cavities and gum disease. Fluoride controversy does exist, but much of it centers around adding fluoride to our water supply, a practice begun in the 1940s. Too much fluoride can cause dental fluorosis, a non-fatal condition that causes discoloration of the teeth. But unless you’re allergic, or eating toothpaste by the tube, you’re unlikely to have issues. You’ve probably seen the little logo on the side of your toothpaste that says “ADA Accepted.” This seal is held by toothpastes that have undergone a voluntary vetting process from the American Dental Association, which verifies that the toothpaste is safe for use and will live up to its marketing claims. We didn’t consider the seal an “absolute must-have” because all anti-cavity toothpastes are already required to meet FDA standards for safety and efficacy. Still, if you’re evaluating two otherwise-equal options, consider the ADA seal a tiebreaker. “To me, the ADA seal of acceptance is important in helping patients navigate the many dental products currently available,” says Dr. Samantha Sacchetti of Village Dental in Kenilworth, IL. After checking all the boxes for safety and effectiveness, one big question remained: how does it feel to actually brush with this toothpaste? We scrubbed using each of our 18 finalists for two minutes per ADA guidelines, clearing our palates in between with a cup of coffee or some crackers. We paid close attention to taste, feel, foam, and how clean our mouths felt afterwards. We also noted the design of each tube and how conveniently it dispensed its toothpaste, a small detail that’s nevertheless important in a twice-daily routine. Clinically proven to prevent and reduce cavities, gingivitis, plaque, and bad breath. 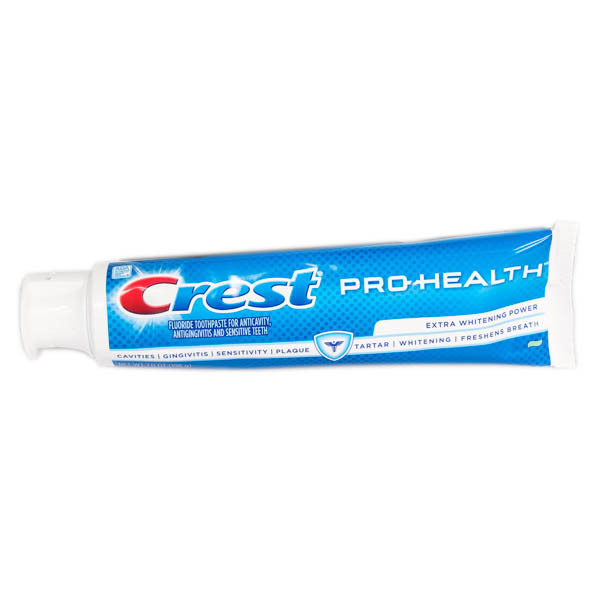 If you want a toothpaste that truly does it all, Crest Pro-Health is the most genuinely multi-purpose product we found. We were initially skeptical of its claim to prevent tooth decay, gingivitis, plaque, bad breath and sensitivity — all while whitening your teeth. But it received the ADA Seal of Acceptance in all six areas, which means it’s got research to back it up. Its efficacy is partly explained by the product’s use of stannous fluoride rather than sodium fluoride. Both types protect equally against cavities, but stannous also has antibacterial properties, which allows Crest Pro-Health to fight gingivitis and plaque — which are caused by bacteria building up in your mouth. Stannous fluoride earned a bad reputation when it was first introduced due to the fact that it caused temporary staining (think white blotches) on the teeth of a handful of users. But Crest introduced a new stabilized stannous fluoride in 2005, and added a whitening agent called sodium hexametaphosphate. Combined, these two ingredients result in a toothpaste with the extra antibacterial benefits of stannous fluoride, but without the risk of staining. We ran our tests with Crest’s Clean Mint formulation, a spearmint that was middle-of-the-road: not too strong, not too mild. “Great flavor,” one tester reported. In theory, stannous fluoride doesn’t taste as good as sodium fluoride. But we couldn’t detect any taste difference between Crest Pro-Health and products containing sodium fluoride. In fact, we found Arm & Hammer Dental Care Advance Cleaning Daily Fluoride Toothpaste with Baking Soda more bitter than Crest Pro-Health. We were less enthusiastic about the slight grittiness of Crest Pro-Health. Crest’s website calls the particles in their toothpaste “ActivClean crystals,” but you’ll see them on the ingredient list under “sodium hexametaphosphate.” These serve as an anti-staining and tartar prevention ingredient, but if you prefer a smoother brushing experience, you might want to check out one of our other picks. Another small quibble we had with Crest Pro-Health was the way it tended to drip out when we opened the cap: a combination of the gel’s softness and the tube’s “flip-cap” dispenser. While it’s definitely not a dealbreaker in an otherwise all-star product, we’d be lying if we said it wasn’t a little annoying. The least abrasive of all the toothpastes we tested, with 5% potassium nitrate to reduce pain while brushing. If you have sensitive teeth and gums and aren’t afraid of bold flavor, we highly recommend Sensodyne’s ProNamel Fresh Breath toothpaste. Like most sensitivity toothpastes, it contains 5% potassium nitrate, a chemical compound that protects and desensitizes nerve fibers in the mouth. If you usually experience discomfort while brushing, or when eating hot or cold foods, ProNamel will bring temporary relief. It also has a strong peppermint flavor that left our mouths feeling fresh. As an added precaution, Sensodyne ProNamel is also free of sodium lauryl sulfate (SLS). For most people, SLS merely serves to create foam as you brush, but it can sometimes cause canker sores. Skipping this ingredient ensures that Sensodyne ProNamel is as gentle as possible on your mouth. Sensitive toothpastes are typically less abrasive than other toothpastes, which makes sense: using a lot of grit on sensitive teeth is like rubbing sand into an open wound. Ouch. And there’s actually a technical way to measure a toothpaste’s grittiness: Relative Dentin Abrasivity, or RDA. The ADA says that anything with an RDA of less than 250 won’t damage your teeth. But for sensitive teeth, most dental experts recommend an RDA under 100. ProNamel’s RDA is 34, one of the lowest we found. The fact that ProNamel is SLS-free does come with a tradeoff: it’s less frothy than standard options like Colgate Cavity Protection. Testers still noted bubbles as they brushed, just not as many. ProNamel is a little pricier than many of our contenders, with a 4-ounce tube retailing for about $8. Colgate Prevent & Repair, by comparison, comes in a 6-ounce tube for $4. A formula that’s gritty enough to reduce surface-level stains on teeth, but gentle enough for everyday use. Tom’s of Maine doesn’t have any harsh bleaching chemicals, instead using hydrated silica to give teeth a gentle scrubbing. (It has also earned the ADA Seal of Acceptance, indicating that it is effective at both preventing tooth decay and making teeth appear whiter.) Hydrated silica is the first ingredient on the list after fluoride, unlike runner-up Crest Pro-Health Extra Whitening Power Toothpaste, which features hydrated silica slightly lower down. Tom’s boasts a refreshingly short ingredient list, lacking both artificial dyes and flavors (though it does contain SLS). We were a little confused by the packaging though, which features a vanilla flower despite no discernible vanilla in the product. Considering that all whitening toothpastes work by scrubbing your enamel with abrasives, we were pleasantly surprised by the smooth, grit-free consistency of Tom’s. It edged out runner-up Crest Pro-Health Extra Whitening Power Toothpaste by a hair: Crest works similarly, but was more polarizing among testers thanks to an extremely gritty texture. This isn’t really an issue with Tom’s so much as a feature of all whitening toothpastes: they only do so much. They can remove surface-level stains but won’t help much if you’re worried about general yellowing. 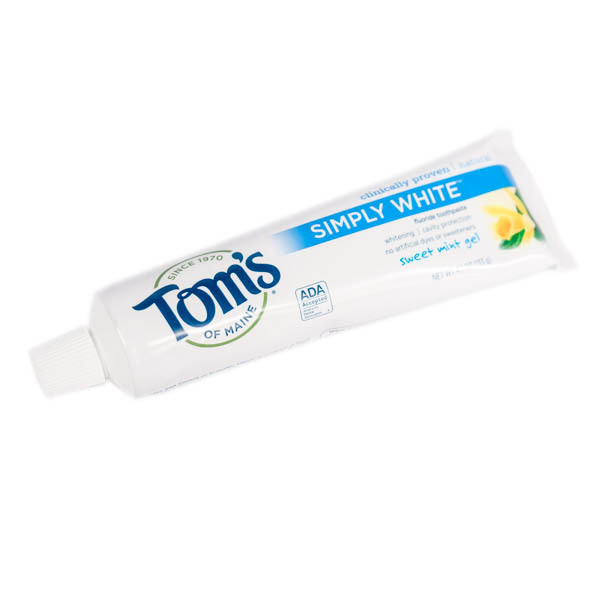 With that caveat in mind, Tom’s is one of the only whitening toothpastes to have had its claims vetted by the ADA. This fluoride toothpaste is free of sodium lauryl sulfate, artificial dyes, and artificial sweeteners. The term “natural” isn’t regulated by the FDA, so we developed our own criteria, starting with a strict fluoride requirement to ensure the full benefits of cavity protection. The Natural Dentist delivers on this score, and also contains natural ingredients like aloe leaf juice and echinacea extract, which have anti-inflammatory properties. We couldn’t find any research about the benefits of these ingredients in toothpaste specifically, but they certainly don’t hurt. 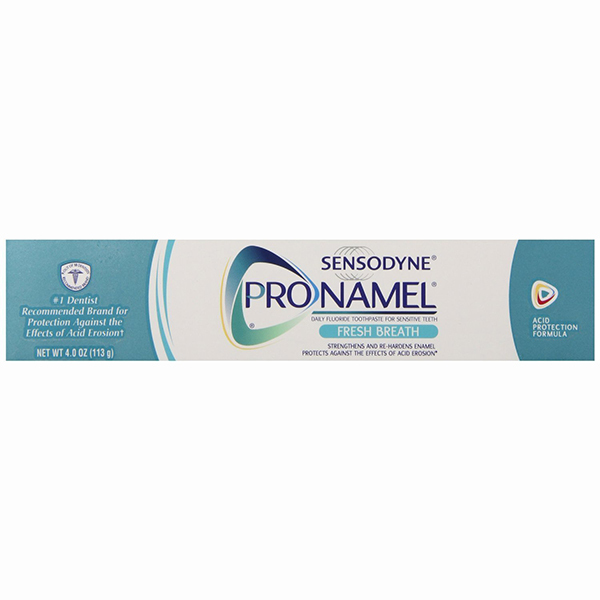 Like Sensodyne ProNamel, The Natural Dentist is free of sodium lauryl sulfate (which can cause canker sores), so it’s sure to be gentle on your mouth. The only coloring agent in this toothpaste is titanium dioxide, a naturally occurring pigment used to give the paste its white color (a pleasant change from the “blue 1” and “red 30” of brands like Aquafresh). It’s also free of artificial sweeteners, flavored instead with a combination of sorbitol and xylitol — naturally occurring sugar alcohols — plus natural flavor. 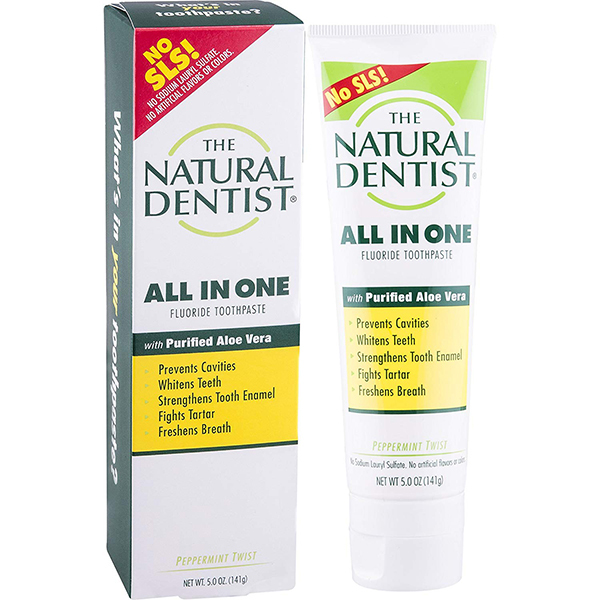 The Natural Dentist does not carry the ADA seal of acceptance, which isn’t a dealbreaker for us for reasons we mentioned up top (all anti-cavity toothpastes require FDA approval before hitting the shelves). Still, if it makes you more comfortable to know that your toothpaste has been “medically vetted,” you may want to opt for a different brand. Testers did find the flavor unusual. It’s described as “Peppermint Twist,” but we were met with a strong burst of anise when we began to brush and could barely detect any peppermint at all. The flavor also faded quickly, though our mouths ultimately felt fresh, with one tester noting that her “tongue felt cleaner” than with any of the other toothpastes she’d tested. The Natural Dentist had no discernible aftertaste, unlike runner-up Biotene, which had a faint bitter flavor that lingered. Most importantly, make sure your toothpaste contains fluoride to protect against cavities. It’s effective in any of its three forms: sodium fluoride, stannous fluoride, or sodium monofluorophosphate. Beyond that, avoiding triclosan (found in Colgate Total and a few other toothpastes) makes sense because it can disrupt your body’s bacterial balance and lead to tooth sensitivity. “I recommend using a basic fluoride toothpaste that does not have all the additives, whitening, and anti-tartar ingredients, especially triclosan,” says cosmetic dentist Dr. Timothy Chase of Smiles.NY in Manhattan. While we loved the one-stop-shop of Crest Pro-Health, if you have a specific issue — say, very sensitive teeth, or a desire for natural ingredients — you’re probably better off with a toothpaste that prioritizes that. We grouped toothpastes into four main categories (general use, sensitivity, whitening, and natural) to acknowledge the precedence they give to your brushing needs. What does the ADA Seal of Acceptance mean? Why are some toothpastes “grittier” than others? The “grit” in toothpaste is there to help remove plaque and stains by scrubbing the outside of your teeth. Relative Dentin Abrasivity, or RDA, is a technical scale to measure a toothpaste’s grittiness. The ADA says that anything with an RDA of less than 250 won’t damage your teeth. But for sensitive teeth, most dental experts recommend an RDA under 100. You can Google “RDA toothpaste” and find a number of charts that list the RDAs for common toothpaste brands. Can toothpaste really whiten teeth? The truth is, toothpaste really can’t whiten teeth; that takes a dedicated teeth whitening product containing hydrogen or carbamide peroxide, which gets past enamel and works on your teeth’s underlying dentin. Some whitening toothpastes do contain a small amount of peroxide, but it stays in your mouth for such a short period of time that its benefits are negligible. What a whitening toothpaste can do is remove surface stains from food like coffee and red wine by upping its percentage of abrasives. What’s the difference between sodium fluoride and stannous fluoride? Crest Pro-Health is the only line of toothpaste we found that uses stannous fluoride, rather than the more common sodium fluoride. In addition to stopping cavities, stannous fluoride doubles as an antibacterial agent, helping prevent gingivitis and bad breath. So why isn’t stannous more common? For one thing, sodium fluoride is cheaper to produce. And stannous earned a bad reputation when it was first introduced due to the fact that it caused temporary white blotches on the teeth of a handful of users. But newer formulations seem to eliminate this drawback. “Today it’s a force to reckon with for those who are taking control of their oral health,” says Turchetta. Is there a “right way” to brush my teeth? Two minutes, twice a day. Use a back-and-forth rather than an up-and-down motion on exterior surfaces. To tackle inside surfaces, hold your brush vertically and use short up-and-down sweeps. Brush your tongue to remove bacteria. Replace your toothbrush every 3-4 months.